Opinion: How long have you been living next door to Alice? 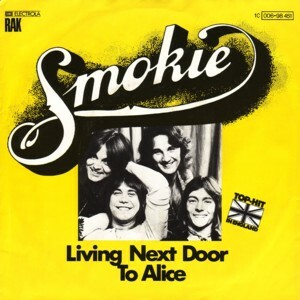 1976: Just the same year Lieutenant Colonel B.S Dimka and his accomplices released the bullets that killed former Head of State, General Murtala R. Muhammad, in a coup d’état in Lagos, an English rock band known as Smokie released a song titled, “Living Next Door To Alice,” that turned out a big hit. According to the song, a young guy was silently in love with a lady called Alice, who he had been living next door to for twenty-four years. He didn’t know how to tell her that he was deeply in love with her; and anytime the word was about to be published from his mouth, it seemed as though someone had just cast a spell on him that rendered him dumb! Days turned into weeks, weeks turned into months, and months turned into years, yet he couldn’t gather the chutzpah to walk up to Alice and share his feeling. This protracted hesitance lasted for a long time until one fateful day the news broke that Alice was leaving to an unknown place! At first he thought it was a fib, but when he dashed to his window and looked outside, he saw that it was real―Alice was truly leaving! The young man was highly devastated. He was devastated because for 24-long years he had been with Alice, yet he couldn’t express his true emotion to her, and now she was gone! He grieved over his monumental loss with the following statement, “Now I’ll never get used to not living next door to Alice…” Okay, I’m not here to push the song, but if you’d allow me few minutes, I’ll share with you a powerful thought. Did that young man have an opportunity to go after his dream? No, he didn’t! Actually, he had 8760 daily opportunities to transform his dream into reality. But did he make use of them? Of course, he did! He spent all of them waiting for just the right opportunity to show up. Alas, before his right opportunity could arrive, his dream had already departed, leaving him yelping in utter regret! Just like that young guy, many talented individuals miss the boat of their dreams simply because they’re waiting for just the right opportunity. Ironically, when you spend time with some of these fellows, you’ll get enthused by the way they let you in on their big, sugar-tasting dreams. But when you ask them what they’re doing to transform these dreams into reality, they immediately switch gear and begin to point to you a date in the future when the work would commence. They keep taking a rain check on these dreams until one day it becomes obvious that they’ve lost out in moving their lives to a higher level. What great dream have you been carrying? What opportunities have you been allowing to slip through your fingers simply because you lack the courage to take action? In other words, how long have you been living with your own Alice next door? Maybe your own Alice is that childhood dream you’ve always had or that big vision that keeps ringing in your heart. Whatever it is, walk straight to it and start doing something meaningful about it before it turns out too late. Now, let’s go back to the song and do some modifications to the plot. Imagine after establishing that he was truly in love with Alice, that young guy gallantly walked up to her, asked her for a date, and, to his greatest surprise, Alice gladly consented. Well, she didn’t only consent, but on that D-day, she also appeared on her beautiful, blue dress that she had always reserved for a special occasion. When the young guy saw her, he didn’t turn dumb rather he boldly walked to her, chivalrously told her how gorgeous she was, and ushered her into the limousine. And then few minutes into their stay at a beautiful restaurant, the young guy confessed, “Alice, I know you may not have noticed it, but I’m really in love with you.” And then, with an artistic smile inscribed on her pretty face, Alice replied, “Sure, I’m also in love with you.” Rather than grieving, the young guy and Alice ended up getting married and lived happily ever after. Just as I’ve carried out this simple modification that changed everything, so also you’ve to modify the way you see your dreams and life opportunities. So, I would strongly advise that you approach the Alice of your life and start doing something about it before you leave, or she leaves!